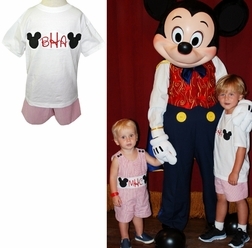 This little Disney Mickey Mouse heads monogrammed outfit is made with a bright and cheery red stripe seersucker and is just perfect for Disney! The shoulders fasten with black buttons, and the crotch of the John John up to size 2 has snaps for ease of diapering. 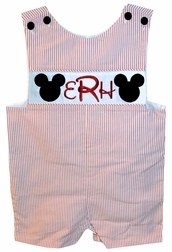 The chest is made with a white panel on which either 2 Mickey heads are appliqued with your little one's name or initials in between. Available in John John or longall OR shorts set as shown.